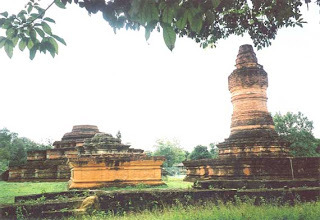 Like many others structures of its kind in Sumatra, this Budha temple stupa near the village of Muara Takus in the Tigabelas Koto district, was built with red bricks and sand. The temple is believed to have been built at arround the 9th century A.D. when the power of the South Sumatra-bassed Sriwijaya Empire was at its peak. Excavations are still being made to determine the precise age and function of the stupa. It can be reached in 118 Km from Pekanbaru.